The Survivor Benefit Plan (SBP) is often the most important decision of your financial life, and it is also probably the most confusing. I can not emphasize enough how vitally important it is to thoroughly understand the Survivor Benefit Plan if a member of your family will remain in the military until retirement. While active duty members are covered by SBP, this coverage is automatic. Coverage after retirement requires a cost-benefit analysis, decision, and the signing of the appropriate paperwork. The issue of military pay for surviving spouses (widows or widowers) is confusing and a little challenging. Military pay, retired or active, ends with the death of the service member, retired or active. However, a program was established in 1972 to allow retiring service members to purchase coverage that provides monthly income to survivors after the service member’s death. This is a separate program from military retirement pay, and it requires certain actions and payment for the coverage after retirement. Coverage for active duty service members is automatic and does not require any action or payments. This program is called the Survivor Benefit Plan (SBP). It is an annuity, with premium payments made from the retired pay, and a large portion (about 45%) of the cost is paid by the government. Military families have all sorts of income needs, depending on their full financial picture and including assets, liabilities, age, health, other income, spousal employment, children, and the “sleep at night” factor. Some families may want or need life insurance, some families may want or need an annuity, some families may want or need both. If an annuity is the right tool for your income planning needs, the price for SBP can not be beat! The most important thing to know is that all aspects of the SBP decision are made when the service member retires. With very few exceptions, any election made at retirement is irrevocable. If married, the spouse is required to agree with the service member’s SBP choice to elect anything less than full SBP. It is very important that retiring service members and their spouses understand all the aspects of SBP so that they can make the right election at the time of retirement. Why SBP Instead of Commercial Insurance or Annuities? How Much Income Is Provided By SBP? Should You Elect SBP Coverage? SBP provides monthly income to the beneficiary after the military retirement pay ends due to the death of the service member. In addition to its relatively modest cost, SBP provides an attractive income stream because it is inflation adjusted each year and it continues until the death of the beneficiary. The benefit amount is either 55% of retired pay, or a smaller amount may be selected when enrolling in SBP. or any other amount between the full amount of retired pay and $300. The base amount is calculated as a percentage of full retired pay, and therefore adjusts with each retiree Cost of Living Adjustment (COLA). With each adjustment in base amount, there is a corresponding adjustment in premiums and benefit payments. This is another way that SBP ensures that benefits are not diminished by inflation. 2.5% of the first $635 ($15.88), plus 10% of the remaining covered amount. For example, $3000 of base amount covered would require a $195 monthly premium for spouse or former spouse coverage. Premiums for child coverage are based upon the age of the retiree, the age of the youngest child at the time of retirement, and the age of the spouse/former spouse, if combination coverage is selected. Contact your finance or admin folks to get exact costs. Insured Interest coverage also has variable premiums that are based upon the age of the retiree and the age of the beneficiary. I’ve had lots of folks ask me what happens if they die before reaching 70 years or making 360 payments. If you elect SBP coverage, your beneficiaries are fully covered as soon as you retire. They will receive full benefits if you die before reaching 70 years and 360 payments and will not owe any additional for that coverage. SBP premiums are deducted from retired military pay pre-tax, which reduces the overall cost of the premiums. For example, if a retiree is in a 25% tax bracket and is paying premiums for spousal coverage at a $3000 base amount, here is a comparison of how paying the premiums pre-tax means that overall taxes are lower. You can also look at it as if the tax benefits are decreasing the cost of the premiums. Income from the SBP annuity is fully taxable. One downside to SBP coverage is that you do not have the choice whether to pay premiums with pre-tax or post-tax money. However, it would be unusual for a beneficiary to be in a higher tax bracket than the covered retiree. Therefore, the lack of a post-tax premium option isn’t negatively affecting many people. A beneficiary cannot receive the full amount of both SBP and DIC. The amount of SBP is offset, or reduced, by the amount of DIC received by the beneficiary. Because DIC benefits are non-taxable, the net income is higher than if just SBP were received. I wrote an entire post about the SBP-DIC offset here: Understanding The SBP-DIC Offset. It’s a little complicated, but you can’t make a proper decision about SBP unless you understand this offset. While the law says that a beneficiary can not receive the full amount of both SBP and DIC, there is a special program that refunds a portion of the offset amount. In response to calls to repeal the SBP-DIC offset, Congress enacted a special payment for surviving spouses whose SBP payments have been offset as a result of receiving DIC. These special payments are called Special Survivor Indemnity Allowance (SSIA). It allows for an extra payment each month that fills in some (or all) of amount that it is offset. In the 2018 National Defense Authorization Act, the SSIA rate was set at $310 per month for 2018, and was made permanent. It will now receive yearly Cost-of-Living Adjustments like other military pays. I have many people come to me and say that the offset is unfair. Whether or not it is unfair isn’t particularly interesting to me, because it is what it is, and it has always been this way. No one changed the rules mid-way through the game. Make your plans with the rules as they currently exist, and deal with changes if they occur. It is important to note that if SBP benefits are offset by DIC payments, the beneficiary may receive a refund of those premiums paid into SBP. There are multiple groups of people who can be covered by SBP, but I will group them into three general groups to make it a little more simple. I am going to give the synopsis of coverage here, because there are so many rules for each individual classification. Spouse/Former Spouse: This is the primary category of SBP coverage, and may also include coverage for a former spouse. Unlike some other military benefits, only one spouse/former spouse may be covered by SBP at any time, and there are a web of rules regarding changes. Children: Children may be covered in conjunction with Spouse or Former Spouse Coverage, or they may be covered alone in the Children Only category. Covered children may only be the children of the covered spouse. You can not cover a spouse from one marriage and children from another marriage. An eligible dependent child must be your unmarried legal child, under the age of 18 or under 22 if enrolled in an accredited college or university. Incapacitated or disabled children are at any age. An incapacitated or disabled child is defined as a child who is incapable of self-support because of a physical or mental disability which existed before the 18th birthday or which was incurred before age 22 while child was pursuing a full-time course of study. Children are the only category of beneficiary that can allow a retiree to designate more than one beneficiary at a time, though payments may not be received by a spouse/former spouse and children at the same time. Multiple children will share the total benefit if Children Only coverage is selected, or if Spouse/Former Spouse and Children coverage is selected and the Spouse/Former Spouse stops receiving benefits due to death or remarriage. The child category includes not only natural children, adopted children, and step-children, but also may include grandchildren and foster children who meet certain eligibility criteria. Others: Service members who do not have a spouse or children may elect SBP coverage for people who have an “insurable interest.” This is limited to one individual family member or non-family member who falls within certain criteria. The family member may be a the only eligible child of the service member (elected in lieu of child coverage), or it may be the adult non-dependent child, parent, step-parent, sibling, grandchild, niece, nephew, aunt, uncle or cousin. A non-family member may include a business partner or joint owner of property. Claims of insurable interest must be documented for non-family members, or family members whose relationship is further than cousin. This category is very helpful for couples who choose not to marry, yet want to provide benefits to their partner. For many military families, full SBP coverage is the right choice. I used to say it was absolutely right for everyone, and then I started working with some families who had enough outside resources to make SBP unnecessary. If military retirement pay is a small part of your overall income strategy, then SBP may not be right for you. Every situation is different. I like to look at lifetime income planning like a bucket. Your goal is to fill your bucket with a variety of sources of income until it is full. SBP is an affordable and quality program to fill a big chunk of your bucket if you don’t already have other big things in that bucket. Other contributors to that bucket might include any other pensions from the spouse’s employment or the service member’s second career, income provided by TSP, 401(k)s or 403(b)s, life insurance or other annuities, Individual Retirement Arrangements, real estate, and other income-producing assets. I go over ten things you should think about in Should You Choose SBP? Even though this post is over 2,000 words long, I still haven’t covered all the nuances of special situations. Be aware that there are many regulations and issues regarding former spouse coverage, disabled child coverage, and insurable interest coverage, to name just a few. You can find more resources to learn about SBP at 10+ Places To Learn About The Survivor Benefit Plan. This topic is dear to my heart, and I love to help people understand it better. The more questions you ask, the more everyone learns. I look forward to your comments and questions. Very informative article Kate, answered a lot of questions I had. Unless he is disabled, or you’re paying for him as an “insurable interest,” your son is no longer eligible for SBP payments. I’m surprised that DFAS is taking out payments if they know how old he is…I’d give them a call and get this sorted out. I am military retiree (24 years service) entered service 1971 and I was medically retiree with a 60 percent disability . All of pay is non taxable and I have SBP 55 percent for my spouse. My question is since my retirement is totally non taxable will my spouse have to pay income tax on her SBP benefit ? I’m a little confused. Are you saying that you waive all of your military pay to receive disability compensation, which is non-taxable? Retiree who enter service prior to 1975 pays no tax on disability pay since I retired at 24 yr(60% ) with 60 percent medical disability I pay no tax . Barrett, I just want to be sure that I’m understanding correctly: it is all military disability retirement pay, and none of it is VA disability compensation? It’s somewhat irrelevant to your specific question, but it may inform the big picture. Hi Kate! My husband died 9 years ago( active duty) and I never got any payment from this sbp benefit. I don’t know if it’s my fault as to what they’ve said, but please enlighten and help me with this. When we got married he has children from his previous marriage, and so he elected spouse and children( Me and the kids) but I never did anything in regards with this sbp entitlement. Time passed and I just remembered about this when they sent me the certificate of my benefits and in the certificate it included SSIA amount, and so I called them to ask why is it showing that I’m receiving an SSIA amount. And they told me that SSIA is part, or connected to the sbp benefits, and later on said that it was a mistake., and the reason i’m not getting the SSIA is because I haven’t elected between me and his kids for the entitlement, and when I called again to ask for more information about it, they said more than 6 six years had passed and I’m no longer eligible for the benefit, because I did not make the election. Now my sbp benefit was forfeited (expires). Is it true that this benefit can be taken away from me?? (Haven’t remarried) please help me, am so confuse and lost!! Thanks in advance and looking forward to your reply! I would appeal that till the cows come home! Whoever briefed you from casualty affairs should have automatically had you sign the forms for SBP and DIC and had you make your election after explaining the benefits accordingly. You also should have received a copy but if not the casualty office has to keep them for a certain period of time. The number for Casualty Affairs Headquarters for your husband’s branch of service can be found on Google. Contact them and explain that you made an election upon your husband’s death but have never received the SBP payment. Now if you have already been receiving the DIC payments, you’re only going to receive one of the benefits fully unless you elect child only, advisable if your kids are still young but know that it ends after college. Appeal appeal appeal! If we have regular life insurance is it over doing it to pay premiums for both? I think this benefit sounds good but is paying for 2 different policies common? That depends on your situation. Every person has different factors to consider, but many families do have multiple insurance policies to meet different needs. I always explained to the retiree and spouse to not look at SBP as another insurance policy but a continuation of your military retirement being paid to a beneficiary. I gave too many briefings to widows of recent retirees who didn’t elect SBP or VGLI and a $400,000 insurance policy usually is not enough to pay off a mortgage, other bills and future college. Think about an insurance policy like this, if your preretirement income was $50,000/yr, than that’s only 8 years of replacement income but not including housing/medical benefits. SBP (a portion of your retirement) will be paid with no questions asked to your spouse at least till he/she deceases. VGLI may seem expensive as you go up on age, but usually that’s when your health deteriorates more and commercial insurance companies can deny you coverage. It’s all about “when” something happens and if you’re prepared. Mom received DIC after 3 years. Ended with an attorney that she paid 20,000. After a week Defas sent a letter saying she may have to pay it all back to SBP. My dad retired after 34 years as a Chief Master and I thought if I could get her the DIC it would help her but so confused. She is 83 and must have someone with at all times. I stay with her every day and have another lady at night. She gets 1689 each month. I understand payback for dollar for dollar. But I’m afraid she will now be in debt with the 20,000. Pat, I’m sorry to hear that this has turned out this way. In my opinion, the attorney you hired should have made sure that you understood the SBP-DIC offset before even taking your case. (And honestly, $20,000? Unless this was an extraordinarily complicated case, I would review that bill pretty darn carefully.) I’m having difficulty imagining a way out of this situation. Sending you hugs. You state that “The price for coverage is far better than any commercially available life insurance or annuity. ” This wild assumption sounds like advice from a 4 year old. My $1.5 million term policy costs me $140 per month. SBP would cost me $195 per month, and would never pay out what my term policy will. DM, comparing term life insurance to SBP is like comparing an apple to a hamburger. Yes, they are both food, but otherwise they not similar. Term life pays a one-time benefit. SBP provides inflation-adjusted, lifetime coverage. If you could find a comparable insurance policy or annuity, I guarantee you that it would cost many times the cost of SBP. You are absolutely correct that term life insurance is often much less expensive than SBP, but they are very different products. If you don’t want insurance-adjusted, lifetime coverage in your portfolio, then SBP is not the right choice for you. Obviously you have done the math, compared the tax consequences, and anticipated what is right for your family and its particular situation. Please don’t assume that you know the answer for every family. I have been paying into SBP for 25 years and 6 months. I am 70. My beneficiary has died and I have no other beneficiary. What happens to all the money I paid in? Robert, I am sorry to hear about the death of your beneficiary. SBP is like insurance – there is no refund of premiums. Your premiums have gone into the the pool and will be used to pay out claims to other SBP participants. If your beneficiary was your spouse, and you remarry, you may add a new spouse to your SBP within one year of remarriage. Wait, so are you saying she paid in for 25 years and isn’t going to see any of that? I’ve been paying into SBP for 1.5 years and am beginning to think it was a mistake. So I’m doing more research that I should have done prior to paying in. Like most insurance policies, the hope is that you never get to collect on the policy. The original commenter purchased SBP in order to provide income to a beneficiary if he died first. He did not die first, and so the policy does not make a payment. We all carry insurance on our homes, but we hope to not make a claim. I carry automobile insurance, and yet I hope to not make a claim. If you choose to replace SBP with life insurance, be sure to have a plan for how those insurance proceeds will be invested in a way that deals with how quickly inflation can erode the purchasing power of a dollar, and also a plan for how your beneficiaries can be assured of not out-living the proceeds from the insurance policy. My husband is 68, and has been collecting Va disability benefits since he was disabled in 2005. I am his second wife, ( 10 years younger) and he is not able to obtain any type of decent insurance coverage due to his PTSD, and many meds for anxiety and depression. So, am I understanding that if we apply for SBP benefits it will automatically be deducted out of his monthly disability payment? And is there a set amount that we apply for, or is it an automatic amount that is deducted? Or is this deducted from his social security benefit? I appreciate all your explanations, and look forward to your reply. I’m retired military. I was talking to an older lady the other day, her husband retired when SBP was just starting. He signed up for it but died less than two years after retiring from the military. She said she was denied SBP payments because he hadn’t paid in long enough. Have you ever heard of something like that? Is there someplace she can go to check on her eligibility? That doesn’t sound right to me. She should formally apply for benefits from DFAS using the instructions at this page: https://www.dfas.mil/retiredmilitary/survivors/Retiree-death/sbp.html Let me know what happens! Kate, Just received word on this issue. The spouse, who was originally denied benefits, nearly 30 years ago, has been approved benefits and they backdated them! This nice lady was not bitter and still talks of fondly of her military memories. But there were years of struggle when her husband died; now all those years of struggle without support suddenly faded away. Thanks for what you do! Hi Roger – that is great news – did she have to hire an attorney to get her SBP benefits? and if so what kind of attorney. She did not. She went to the site and reapplied. When they requested documents, she sent them in. Someone called once and she answered some additional questions. But that was it. The check just showed up in the mail – she told me at first she thought it wasn’t real! A veteran’s service organization will often help with this and services are free. I worked for one for a few years, and this same scenario happened in our office twice! My husband a veteran died 20 years ago. I am also 100% disabled. He finally was awarded 100% service conneted disability. It took me the surviving widow 15 years . I found out that I did not get paid the right amount of SBP.That it is no more an off set decission of Sharp vs US government. What must I do do recheck this? I m not planning on remarrying due to my poor health. Will they reimburse me for the last 20 years and what should I really ave gotten since now his disability was 100%. Will they also reeimburse me for all my medical bills that I paid in the past? Angelika, I’m afraid I’m not sure what you’re explaining. Your husband was awarded 100% service connected disability while he was alive or posthumously? You say you were not paid the right amount of SBP. Is that because of you were awarded Dependency and Indemnity Compensation? If you can provide me with more information, I can try to help with answers. Kate, I’m about to medically retire and have no dependents or former spouse. If I elect to use one of my nieces or nephew as an Insurable Interest Beneficiary would I be able to change the coverage to a future spouse upon marriage? Thanks for the article and knowledge. Great question! Per this webpage http://militarypay.defense.gov/Benefits/Survivor-Benefit-Program/Stopping-SBP/, “After retirement, insurable interest coverage may be changed to cover a newly acquired spouse and/or child within one year of the first marriage, birth, or adoption.” And, honestly, it seems to make sense to me. Just be sure if you do marry or have a child that you make those changes within one year. I have met several folks who didn’t meet the one year deadline and were unable to cover their spouse. My husband is paying for 7yrs SBP, he is 61 yrs old, I was worried if he can’t paid 360 months. What would happen if they do not pay the 360 ​​months? worked for 30 years in the Marine. We are worried that we will be paying $ 300 and something for nothing. Sandra, I’m not sure what you mean by “can’t pay.” Once the cancellation window has passed, there is no provision to stop paying. Once he elected SBP, those payments come out of his retirement pay automatically. The requirement for paying in is 360 payments, or until the retiree reaches 70. As long as he reaches 70 you are good to go. Jessica, this is incorrect. The requirement for SBP to be paid in full is 360 payments AND reaching age 70. Once you reach age 70, you still have to complete 360 payments. I am a retired Marine, approaching 70 yrs in 2019. I took sbp for my wife and retired in May 01. was told I had to stop payments and find insurance when I turned 70. Does sbp still continue, as long as I pay, even after I turn 70, assuming I live that long 🙂 ?? Can’t find gov info on that particular subject.
? About SBP- If annuity payable amount is 55% and base amount is approximately $2350.00 will the monthly spouse cost of $277.00 come out of the approximate payable benefit of $1292.00 if spouse hasn’t met the 360 month and 70 year requirement? Faith, let me see if I am understanding your question. Are you asking if the premiums must continue to be paid if the insured dies? No, they do not. If you are asking about something else, please let me know. My husband is paying about $270.00 in a month now. At the bottom of his statement it says “spouse cost” $274.00. And then the payout summary reflects the amounts I provided previously. I guess I am trying to figure out what the term “spouse cost” is defined as and then if the the premiums do not continue if something were to happen to my husband. Thank you for your explanations- These matters can be so confusing. My husband retired two years ago and I thought I was on top of understanding the systems the military has in place but just transitioning to Tricare retirement in an area that makes it difficult to utilize your benefits has been complex and asking a million questions when there isn’t really any one person to turn to can make you want to throw your hands up. I am the kind of person who wants to understand and to have the answers when my husband asks me what these things mean. Instead of throwing my hands up I am considering trying to get some kind of life coach training to be able to assist other military wives that are transitioning into retirement-it feels like it is more difficult than it needs to be and I often wish there were more people like you to turn to for questions that just don’t make you want to call the assigned number, talk to a computer, be transferred ten times and annoy someone until they are finally willing to help. Thanks again for what you do. I’m glad I was able to answer your question. Feel free to send more! My 83 yr.old mother sent in form 2656-1 and was just denied and we have 30 days to appeal. Parents married 18 years 1958-1976, Divorced 1976. SBP never mentioned in divorce decree at all, Father died 6/31/2000. I have copy of 20 year retirement letter 6/23/92, he retired at 60. I have paperwork showing he paid for Plan C into SBP and copy of retirement pay statement dated 12/04/97. According to statement something was deducted. My mother never received notice of her entitlement for RCSBP (could be they sent notice to an old address) and never knew she was entitled to it and neither did I until I read about it online recently. How do I prove he paid into SBP and get proof of who the beneficiary is? Ann, this is beyond my level of knowledge, but here are my thoughts: Former spouse SBP coverage wasn’t even an option until 1982, so it wouldn’t have been included in their divorce. If your parents were already divorced at the time your father retired, your mother would not have received any notification because it is not required for former spouses as they don’t have any inherent rights to SBP coverage. I’m not sure you will be able to get DFAS to tell you who was covered under your father’s SBP, but I guess it doesn’t hurt to ask. I’m 61 years old and I plan to retire from active duty in December 2018. Does the requirement for SBP to be paid in full 360 payments and reaching age 70 apply to all ages?. If so what is your advise for me because I don’t think I will be able to meet the 360 payments base on my current age of 62. I’m guessing that I will still be making this payment in my early 90s. Yes, the requirements for SBP to be paid in full are the same for everyone. Most people are paying SBP premiums into their 80s, and 90 is not uncommon for reservists. It does not change the decision whether SBP is the right choice for your family. I hope you can sit down with a financial counselor to look at all the options available to you. Father died oct 2014. One month later I put my mom in for dic and in January 2018 it was approved. She received a check for backpack and I don’t understand y. Everything I read says you can receive dic and SBP is ofser. Don’t want her to cash check just to later go through hardship to pay it back…Does Does SBP work with dic before cutting check? Who cuts it? Confused. I’ve read lots of things that va cuts check and then has to pay it back because retirement wasn’t notified. I am a retiree and I have been making monthly SBP premium payments for Spouse/Child coverage since my retirement. When my children reach age 22, will my monthly premiums be reduced (since they will no longer be covered)? Hi Rich! Your SBP premium should automatically decrease once you don’t have any eligible children. I’d definitely keep an eye on it, though! If my retired spouse dies before age 70 and 360 months haven’t been paid in SBP, am I still eligible to receive it? Yes, Sandy, you are covered under SBP immediately. The age 70 and 360 month is just the “paid-up” cut-off, after which no more premiums are required. Kate, I have been paying into the SBP for 11 years now. I have a disability rating of 80% so not all of the payment is taken out of my pay. It has been accruing over a deficit over that time. Will they allow me to break down that deficit to catch up or will they take it all at once. Secondly, there is no way out of the SBP after the 36 Month mark ? Jeff, are you asking about repaying that deficit now or how that deficit will impact annuity payments made to your survivors? Have you reached out to DFAS for the answer to this question? In the meantime, you can make arrangements for your SBP premiums to be made from your VA pay using Form 2891 or you can make payments directly to the VA using the address listed on this webpage. Assuming the eligible beneficiaries are still eligible, the only window to terminate SBP coverage is between the 25th and 36th payment. I was medically retired at 16 years this past June and I elected SBP at time of retirement. I found out immediately afterwards that I was 100% permanent and total with the VA so SBP serves me no purpose as far as I undsdstand it. I haven’t made any payments into SBP as I haven’t received retirement pay from DFAS and only disability from the VA. I’m not sure if should attempt to catch up or just wait it out until I can cancel it. Any advice would be helpful. Thank you. Hi Phil! Great question. While it may seem on the surface that SBP serves you no purpose, there may be some reasons why that’s not 100% true. First, you’d have to look at the size of your SBP benefit vs. the amount of DIC. If you elected the full SBP, the benefit is 55% of your retirement pay. If that amount is more than the amount of DIC (currently $1,283.11), then your spouse would still get some benefit from SBP. Second, survivors who are affected by the SBP-DIC offset are eligible for a $310 month allowance called the Special Survivors Indemnity Allowance (SSIA). This program was made permanent in the 2018 National Defense Authorization Act (NDAA) and will now be adjusted each year for COLA. Third, if your death is not attributable to your military service, your survivors are not eligible for DIC until you have been 100% P&T for 5 years (if they are considering that you were 100% at the time of discharge) or 10 years if they don’t consider the 100% determination to have begun at the time of discharge. (I don’t know how that’s coded on your paperwork.) As awful as it is to consider, you could be involved in a car accident or develop a completely unrelated medical condition during this time. SBP coverage would then be the only coverage. The fourth thing to think about is whether the SBP-DIC offset will be repealed at some point in the future. Military lobbying groups like MOAA have made this a top priority and I think it is possible that it may happen. As you are 100% P&T, you will have more windows to withdraw from SBP than the average retiree. In addition to the “regular” 25th to 36th month option, you also may withdraw from SBP once you hit the 5 year/10 year milestone discussed above. However, there is no return of premiums if you withdraw from the plan vs. return of premiums if you continue with SBP and your survivors are impacted by the offset. Hi Kate. This is a great website. You are very kind and thoughtful to do all this Q & A. It is very helpful. Hi Kate, I retired at 62 three years ago and may not live until 92 if I die as I understand your previous post, my wife will receive the SBP payment even though it is not paid in full. Will SBP payments be subtracted from her monthly payment until it is paid in full? Must I live until 70 (hope I will) for her to receive payment? What if I die at 69? Hopefully she will still receive payment. Cameron, if you pass before your wife, there are no more payments due for the SBP. I hope that eases your mind. I read through the comment section. I retired (medically) in 2013. I am currently at 90% from the VA and have my payments sent to DFAS from my VA offset. My question is: If I become 100% in the next years (appeal in the mail) does it make sense to continue paying into SBP after the five-year mark? My wife is 10 years younger than I am. We live in Central Europe and I want her to have a steady income in the event of my passing. I tend to look at this coverage as income insurance, not life insurance. Is that a correct assumption? Thank you for addressing my two questions and thank you in advance for your response. In this article, I list four reasons why you may want to keep SBP even if you are 100% disabled. https://www.katehorrell.com/understanding-sbp-dic-offset/ You’ll have to apply these considerations to your specific situation to figure out which option makes the most sense for you. In my opinion, keeping SBP makes sense for a lot of people. Thank you for your response. This was just the information I needed to make the best decision for my family. My father passed away Jan 18th 2018 at the age of 75, he retired back in 1982 with 21 yrs. of service in the Marine Corps. My mother was just informed by DFAS that my father had not elected SBP when he retired. I have been looking around some websites like DFAS, Military.com, DODWarrior to name a few and have found that upon retirement the spouse has to consent in writing to reduce coverage or elect no coverage, I have not found any paper work showing that my mother made this election nor have I found a SBP election certificate (DD-1883). Do you know if back in 1982 this was still the case that the nonmilitary spouse had to sign to not participate or could the retiree make the election without the consent of the spouse? What is your opinion on appealing to this case? Question 4. Although I am eligible to participate in SBP as member of the uniformed services, does my nonmilitary spouse have any say in the election process? Answer: Yes, Your nonmilitary spouse can veto your election should you elect not to participate in SBP or elect not to participate at the maximum level. Every retiring member is automatically enrolled in SBP for full coverage unless the spouse consents in writing to reduced coverage or no coverage. Cynthia – I am doing some research but it is slow. My suspicion is that spousal consent came into effect after 1982, but I am not sure and I’m surprisingly having a hard tie pinning down the date. If you do not hear from me in a few days, please remind me! My husband hasn’t made an SBP payment since he was declared 100% P&T disabled in 2009. Our situation is similar to the gentleman above, Phil, except that my husband still gets bills from DFAS stating now that he owes $8,671.07. They’re not charging anything under the section “This Month’s Cost” but keep tacking on 6% APR every time he gets one of these bills. He was married to another lady when he originally elected to take SBP, although he says he felt forced to do it by his officers at that time without proper explanation of what it was all about. He never told his ex-wife anything about it since he was told it was best to just sign it and deal with it later. So, if he withdraws next year, does he have to contact his first wife in order to do that? That would put us in a very awkward situation since she never knew anything about it and she became very mean to him around that time up until they divorced, and even now. My question is: If he passes away before me, will I have to pay this, or will they deduct it from my DIC payments, or can we just keep ignoring the bills and just withdraw next year after the 10-yr. mark? Or would SHE be liable to pay back the money? There is no SBP information whatsoever on my husband’s myPay account. I have put hours into researching for an answer to this question and finally came across your site. I see that you’re still answering questions on this topic for over a year now and you’re probably ready to be done with this, but your response will be greatly appreciated. Thank you! 1. Did your husband inform DFAS of his divorce and elect to continue former spouse coverage on his ex-wife. 2. Did your husband inform DFAS of his new marriage and continue to elect his former spouse as beneficiaries even though he was married to you? 3. Why is he not paying the SBP premiums as required? It can be paid out of his VA disability compensation, he just has to authorize it. the back amount debt would be paid by the SBP premiums + interest. Whomever is eligible (former or current spouse) would just have the SBP payment apply until paid in full and then start receiving monthly SBP OR they can pay it up in full and the start receiving the monthly premium. Linda, there is no provision to change beneficiaries on SBP. For those who want to purchase a product that permits a change of beneficiaries, SBP is not the right product. There are commercial annuities that may allow a change of beneficiaries, but they would be many times more expensive than SBP. I’m sorry that your father did not understand that when he made the choice to enroll in SBP. I never knew that some of the benefits military veterans get only activate when they retire. My grandpa was in the air force and has recently retired. I appreciate the information on the military benefit plan. I am receiving military retiree pay after 21 years of active service. I was also rated 60% disabled by the VA and received concurrent disability. Recently I applied to have the VA disability increased from 60% to 100%, which was approved. However, it may appear that I cannot received both, and that my military retirement pay will stop. I have paid SBP for 23 years. How do I continue to provide SBP for my spouse, or does she lose that benefit despite these years of payments. I most definitely want her to have that protection, particularly given my life expectancy. Mr. Mann, you can continue your SBP coverage by electing to have the SBP premiums deducted from your VA disability compensation or by paying the premiums directly. Directions are located on this webpage: https://www.dfas.mil/retiredmilitary/provide/sbp/payment.html The link to the actual form is not good, but you will have the form number to ask for assistance from the VA.
What if SBP payments were made and I was a spouse but divorced . It is still in my name so I get those benefits after death? I am preparing to retire as a Navy O-5/commander after 31 years of service. SBP will cost me (at least) $585 (6.5% of $9K). Accordingly, I am strongly considering a $1M term policy, primarily to handle the mortgage if/when I pass before it’s paid off. I am also confused about your retirement pay and subsequent SBP premium calculations. I calculate that an O-5 retiring at 31 years of service will receive approximately $5574 in retirement pay if retiring under the High 3 system. 6.5% of that amount is just over $362 per month, and SBP would provide an inflation-adjusted benefit of $3,066 per month. Also keep in mind that life insurance vs. SBP is not an either-or question, nor is it an all-or-nothing question. Many people find that a combination of term insurance and SBP fulfill their needs better, and you don’t have to opt to cover the full amount of your military retirement pay. Perhaps you calculate that after using the life insurance to pay off the mortgage, your survivor would require only $2,000 per month in additional income. You could elect to cover 2/3 of your retirement pay, pay a corresponding premium, and provide corresponding benefits. As a drilling reservist, I have already passed the date of retirement eligibility and took no action so assume I I fall under Option C (spouse only, annuity benefit on full retired pay base). My spouse and I are separating and as part of the agreement we are working through I wanted to ensure that her share of retired pay was retained. Since the physical separation and while working through the agreement and court review before final decree, I was promoted and continued to drill. Both of these contribute to a higher premium and higher annuity benefit than was intended or may be needed. I understand the opportunity to elect former spouse coverage within 1 year of divorce. What I am trying to get clarification on is if I can elect a reduced benefit amount (consistent with the intended annuity) either at the time of electing former spouse coverage or perhaps is it when I officially retire (but not yet collecting retired pay) which will be in about 3 years. If anyone has experience with this situation, please share as I am trying to determine the best option. In this case, the additional annuity amount may not be needed, nor the increased premium. If it is forced by the process, then another option may be needed. Hi Kate, great article thanks for the wealth of knowledge. My husband recently passed, after reporting to dfas etc, they have sent a letter saying that my Husband made an sbp election but payments had not been being deducted from his reitrement pay as elected at time of retirement. 2. I read on the DFAS website that, in the event of direct deposit payments( I don’t feel is classed as a deduction as they said) being missed , that the missed payments must be deducted from the total annuity, upon the annuitants claim therefore reducing the annuity amount by the amount of missed payments. Oh, gosh, what a mess. I’m sorry for the loss of your husband. I’m afraid the best advice I can give is to retain a lawyer and/or reach out to your elected representatives. I usually hate that advice, but I don’t know what other recourse you might have in this situation. Can you look at your husband’s past retiree account statements and see if the SBP premium deductions are reflected there? My dad died in 2017 at the age of 80. He was considered “paid up” with his SBP over 10 years ago. My mom notified both VA and DFAS of his passing and applied for survivor benefits. Unfortunately, my mom passed away 6 months later. She never received SBP prior to. We received notice that the premium cost would have to be refunded. What does this mean and how is determined? The years they were married or the time between their passing? I think maybe you are misunderstanding something, Anne. SBP premiums are only refunded if the survivor is subject to the SBP-DIC offset. I’m unaware of any other situation in which premiums are refunded. It is possible that you might be able to make a claim for the SBP benefits she should have received between his death and her death. I’ve not known anyone to that has been in your situation but it might be worth applying. My child is the beneficiary, when my child turns 18 and not in college do I get to stop paying SBP payments? Jerry, yes, you should automatically stop paying premiums when your child turns 18, if the child is not in college. Hi Kate, I haven’t had time to read all through these posts, but my question is,- my husband died August 28, 2017 with service related death. I did not know about the offset until his death. -I receive DIC, and SSIA, but he paid into SBP every month for 30 years. “Shouldn’t I receive some kind of refund for the 360 payments he made to DFAS?” My husband and I would have made another choice if we knew about the SBP/Offset ruling. 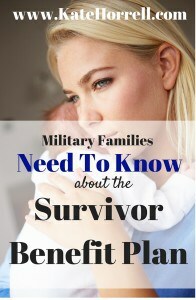 Thank you for helping us military widows to find answers. Kathryn, did you apply for SBP and it is being offset by DIC? You are entitled to a refund of the premiums made, pro-rated if not all of SBP is offset. To the best of my knowledge, there is not a separate form to request the refund. If it was not paid to you automatically when it was determined that your SBP would be offset by DIC, then I’m thinking the next step would be to contact DFAS through one of these methods. https://www.dfas.mil/retiredmilitary/about/aboutus/customer-service.html (You’re probably considered an annuitant even though you’re not receiving an annuity.) I hope that helps; please let me know what happens and if I can do anything else to help. If the spouse receives DIC & SBP but (because of the offset) is getting very little SBP and so chose not to have any tax withheld from it… will the (possibly large) SBP cost refund be given to her also without withholding any tax? She knew nothing about a refund and that refund could result in a large irs tax penalty! If that situation were to occur, she could make an estimate tax payment to the IRS. It is a very simple process and folks do it all the time when they receive a lump sum of taxable income. I’ll have to check and see if anyone knows how taxes are withheld on the refund – if it is withheld like a bonus or as directed on the W-4. I’ll let you know what I find out. Thank you so much for your help! We’d really appreciate it if you could find out how taxes are withheld on the refund. When I received the return of SBP premiums they withheld about 10%. However they showed the full amount as taxable income even though they had kept over $8000 as the return of the sbp they had paid before I got DIC which had been backdated. Tax has already been paid on the $8000 so I will have to make an adjustment to this years taxes. I read your post with interest and have a question for you. The 10% they withheld… is that the amount you instructed them (on your W-4 form) to withhold, or did they select to withhold that amount on their own? No I never requested that they withhold taxes on the return of premiums however when I was receiving sbp they used to withhold taxes so I expect I had asked them to do that in 2016 and they still had that information. Thanks for your reply, Monica. It seems the premium refund can really complicate our taxes. Best of luck to you making an “adjustment” to your taxes… I hope everything works out well for you. We were informed we qualified for a premium refund but they did not give us a time frame of when to expect it. How long did yours take to receive? It took about a year. I did make two phone calls just to be sure they were still working on it. I’m 100% permanently and totally disabled from the VA since 1996. I’m 50% from the Marine Corps. I’ve never paid anything into spb, but have been recieving Bills forever. It’s not a hit on my credit. All my kids are over 18. It was only for my kids, and when I signed up for it I had no clue what I was doing. Will they ever try to collect past due? I have a new wife, would it be worth it to transfer to her and get up to date? My original plan was to never pay it. Let me make sure I am understanding your situation correctly: When you retired, you elected child only coverage for SBP, but you’ve never made any payments? They haven’t been paid out of your retirement pay or your disability compensation? It is my understanding that those bills would eventually be paid out of any beneficiary payments, but if all your kids have aged out, then you shouldn’t be adding any new premium costs. With regard to the new wife, if you have been married less than a year, it might be worth getting caught up with the payments (if they will let you) and adding coverage for her. It all depends on your specific situation and if that is a good tool for your specific needs. Let me know what you decide and what you learn. Thank you for this excellent information. My husband died in 1994 and I have been receiving SBP since then. I recently was awarded DIC and I am now Offset. Once the dust settles, I understand I will receive reduced SBP, full DIC, and SSIA. I have read that I may receive prorated SBP premium refunds. I would assume over 24 years since my husband’s death, I have received more SBP payments than SBP premiums we paid from 1982-1994 (retirement to death). Is this the formula they use for refunds? Premiums paid vs SBP received? Thank you for your understanding of this complex issue. I invite you to join Military Widows: SBP-DIC Offset on FB. Gloria, the SBP premium refund is calculated using the total premiums paid vs. the portion of SBP that is offset by DIC. Does that make sense? can you answer this question for a follow vet? how does it work for veterans who were Medically retired at 8 years. Vet in question has a SPB for his spouse and kids. he will turn 70 in a few month and has paid pretty close to the 360 month requirement but he not in good health. He’s is either 90% or 100% VA rated disability and his Medical retirement (8years )is rated at 70%. He doesn’t get more then $150.00 dollars a month for retire pay (offset) since he didn’t serve for 20+ years and his VA rating pay was higher then his medical retirement. his current monthly payment is around $13.00 dollars. He is worried that he been wasting his time paying for the SPB? since he only receive $150 dollars a month for retirement. Gabriel, there are a couple of things going on here, but regardless he won’t have wasted his money paying for SBP. It may have turned out to be a brilliant idea, depending on how things unfold. However, it’s important to note that not all retiree deaths fit the criteria to receive DIC. For survivors to receive DIC, the death must be related to a service-related injury or disease, or the retiree must have been receiving that VA compensation with a “totally disabled” rating for at least 10 years prior to the death. (There are a couple of other categories, but it doesn’t sound like your friend falls into them.) The vast majority of military retiree deaths do not fit into this category, and therefore their survivors are not eligible for DIC. In this case, your friend’s family would only receive SBP payments. Those payments would be made on his full retirement pay, not the offset amount he has received. My question is regarding the child only SBP. My child will be 22 and no longer eligible for the benefit in a few years. I will have been paying into the child only SBP for 15 years by then. I understand that he will not be eligible for benefits after he is 22. I assume my payments into the SBP will stop. Since he is not longer eligible for benefits, what happens to the money I paid into the plan for 15 years? Is it lost? It isn’t “lost,” it has paid for the coverage that you’ve had for the last 15 years. (And remarkably cheaply, at that.) I have never understood this perspective – perhaps you can help me? When I pay for car insurance, I don’t think I’ve “lost” when I don’t make a claim in a year. In fact, I’m pretty thankful that I haven’t been involved in a situation that required a claim. When I buy food, it isn’t a loss, it’s trading money for a goods or service. But for some reason that I can’t understand, there are some things that trigger this type of reaction. In particular, life insurance/survivor benefits and renting a house. Can you help me understand how not making a claim against survivor benefits feels like you’ve lost money, but a comparable situation (like auto insurance) doesn’t feel that way? For reasons that I cannot recall my wife and I chose the child only option. That child will be turning 18 in January and not attending college. When she turns 18 will I then be able to change my SBP to my wife? Thank you for your help. I am unaware of any such provision in the SBP rules. I suppose it wouldn’t hurt to as DFAS – maybe there is some loophole that isn’t publicized. Good luck to you. Dear Kate. Here’s hoping you can clearify this (possibly) unusual situation for me. Retired since 1988. Elected SBP for spouse. Divorced 1992 with SBP required in divorce decree. To the best of my knowledge no DD Form 2656-1 was filed after divorce. It is my understanding this must be filed within one year of the divorce in order to officially initiate the SBP coverage for the former spouse. The former spouse left the U.S. shortly after the divorce and I have had no contact with nor do I even know where she is located. It has been over 25 years since the former spouse left this country. I have completed the 360 SBP payments and am over 70 years of age, therefor I no longer am being billed for these payments. I am single with no dependent children. Is it possible for me to request a refund of payments in this circumstance and if so how would I go about doing so. I have considered going to the nearest USAF base personnel offices and speak with a SBP knowledgeable officer or NCO. What do you think? Thank you much and appreciate the information you put forth on this site. It is wonderful. This certainly is a unique situation. Was DFAS notified of your divorce when it occurred? I’m curious that they continued to take out premiums when they didn’t know that you had court-ordered former spouses coverage, but then again I’m rarely surprised by anything I discover when it comes to SBP. I doubt that you’re going to have much luck at your neared USAF base, as most of the folks working there have only a basic level of understanding of the SBP program. While I’m not overly optimistic, your best bet would be to contact DFAS directly. Good luck to you! I have children only SBP. My youngest attends college full time and will turn 22 in 2 months(december). My children will no longer be eligible to receive SBP if I die. Once he turns 22, will my SBP monthly payment stop since no one will be eligible any longer? Will it stop automatically? My husband divorced his now ex-wife while still active in the Military. I had to sign a waiver of SBP otherwise she would have not agreed to the divorce. My husband was court ordered to enroll her in SBP. SPB was stopped once she remarried and my husband obtained her marriage license. That marriage to another service member (NG or Reserve, not sure) lastet for about 7 years. When my husband found out that she would be eligible for SBP Benefits again, after her divorce from her second husband, he asked her for the divorce decree, but was just told that it is not of his business! His RAS states “No SBP election is reflected on your Account”. Since she is getting part of his military retirement she gets her own RAS from DFAS, correct? Could it be that she did provide the divorce decree to DFAS and pays her own SBP premium? She is now 52. Do we have to be worried? Hi, I cannot seem to get a clear answer from anyone at DFAS on anything related to my husbands pension (SBP) since he died. My question is I just recently found out I wouldn’t be getting my husbands retired pension because he didn’t elect to take out SBP when he retired from the military back in 1993 after serving 30 years in the Navy. We have been married the entire time (44years) and I know I never signed any forms giving up my right to his pension when he dies considering he was 10 years older than myself. I cannot get any answers from anyone and struggling to survive. Can you give me any advice on what to do? Kathrine, I’m so sorry for your loss. I’m looking up some information and it might take a little time. The law requiring spouses to agree to waive SBP was enacted in 1986, so you should have been asked to sign for anything less than full SBP. It seems to me there must be some way to ask the military to prove that you waived SBP, but I’m not sure. I’m asking around. Please nag me if I fail to get back with you. Thank you so much for responding because I don’t know what else to do. My husband retired in 1993 and I pulled out all of his retirement papers and and there is no forms with my signature on anything giving up my rights to SBP or form of any sort to SBP. My husband never discussed pension amount or anything of the sort when he retired. The only conversation I remember is someone sold him a VGLI which at the time was less than 6.5% SBP premium he would have paid. I am sure the person who sold him on the VGLI didn’t explain how the premium would go up dramatically as he got older. When he died we were paying $700.00 a month in premiums and only $86.00 when he retired. My husband was not good at money and to be honest I didn’t know anything until he died that I would not be receiving his pension. DFAS would not give me any information even though I mailed in the forms to claim SBP and they mailed back forms for direct deposit and mailed them back but nothing has happened since and that has been months. I would be more than thrilled if you could at the least guide me in the right direction or phone number for me to call. I just cannot believe after 44 years of marriage for me to remember my husband this way. Thank you so much for your help. I don’t want to share too many of your details in a public forum. Could you please email me at kate at katehorrell.com? My USAF father passed away and my mother started receiving his SBP benefits. We were surprised that taxes withheld were very low; enough to require her to pay a penalty for underpayment. Can you explain the best strategy to make sure enough taxes are taken from what she receives or is this a situation where she must file estimated taxes on the earnings? Can we increase the deductible? If so, where do we find the appropriate form? Your mother should change her income tax withholding via the online MyPay system or by physically mailing an IRS Form W-4P (available at https://www.irs.gov/pub/irs-pdf/fw4p.pdf) to DFAS at Defense Finance and Accounting Service, U.S. Military Annuitant Pay, 8899 E 56th Street, Indianapolis, IN 46249-1300. If your mother does not have a MyPay account, I suggest that you help her establish one. It provides 24/7 access to her annuitant statement and early access to her 1099 tax documents. Penalties for underwithholding are subject to a wide variety of exceptions – I am surprised that your mother actually had to pay a penalty. You might want to double check with an experienced tax advisor to ensure that was correct. If you are divorced and have overpaid into your spouse benifit plan how long does it take after you send in your divorce certificate to receive the over paid sum? I am a retired US Army NCO. I did not elect the SPB because I thought the program was borderline criminal. Please let me provide my thoughts. 1. SBP and Life Insurance do not compare equally, but SBP is a form of life insurance. The reason for enrolling into SBP is to take care of your loved ones if you (military member) pass. Let’s say my retirement is $2000/mon, then my spouse would receive approximately $1100/mon for life, with increases of Cost of Living. The payment for that SBP (policy) is roughly $130/mon. For that same $130/mon, I can purchase a life insurance policy between $750,000 and $1,000,000. Simple math shows that by putting that money is a savings account earning 2%, my spouse would earn $2000/mon with the exception that she also has $1,000,000 in the bank. Yes, premiums go up with age, but with a policy like whole life, my spouse is still better off… much better off. 2. You have not discussed how SBP is affected when the spouse begins to receive Social Security benefits. Like DIC, SBP is affected by Social Security when the surviving spouse turns 62. The benefit drops from 55% to 35% assuming the spouse elects to receive social security. You’ll have to search hard for this information. This is one of the biggest shams of SBP that no one wants to admit. 3. I understand that you mean well, but trying to convince people to sign up for SBP is wrong. You should present all the facts. Make up a chart that reflects the earnings of a surviving spouse of an E7 with 22years. Assume no DIC and go from there. Good luck with trying to find a site that furnishes all the information. The government does not want to show just how much they are scamming their own Service members. I’m sure you mean well, but please, show all the facts. Sir, I have no desire to convince anyone to sign up for SBP. That is a very specific decision individual to each family. However, your analysis fails to include several important considerations and one glaring factual error. You also assume that everyone is insurable at such low rates. Many, many retiring military members find themselves paying much higher rates, or completely uninsurable. 2. The SBP-Social Security offset was eliminated in the 2005 National Defense Authorization Act. 3. The federal government does not make money off the SBP program. In fact, the government contributes approximately 45% of all SBP payments made. (The numbers vary, and that is rounded.) The SBP program costs the federal government. It takes less than 3 years of SBP benefits to recoup every cent that is paid into SBP even if the service member paid in the entire 30 years before reaching-paid up status, and that assumes that there is no cost of living adjustment in that entire time. Due to COLA, the actual “payback” period is significantly less than 3 years (exact time will vary depending on the various COLA during any individual timeframe. I’m wondering if I can make a legitimate waiver request, and the best way to go about stating my case, to DFAS regarding The Barring Act, 31 U.S.C. section 3702 regarding SBP payment of any claim not received within 6 years from the date it accrues – basically a claim for Arrears of Pay. My Mother passed away in August of 2006, and my Father, a retired Veteran, passed away at the end of December 2017. I submitted the request for the pro-rated amount of his last annuity pay. I had not heard from DFAS for over a year. Finally made calls and that’s when I learned that there would be back payments that needed to be calculated. Received a letter from DFAS this last week informing me that from the period 09/01/2006 to 12/29/2011 back pay would not be eligible. But back pay from 12/29/2011 through 11/30/2017 would be valid. I was told that my Father had not informed DFAS of my Mother’s passing in 2006 as he was suppose to do. I’m not sure he knew to do that. DFAS told me that it is listed all the time in the ECHOES publication and that he should have known to do that. Have I a leg to stand on at all? And what kind of documentation should I submit? Thank you, Shellie (daughter). I’ve been separated for eight years(2011) from my spouse (married in 2000). He retired from USMC in 2014 and he did not elect me for SBP. I am now finalizing the divorce; I am seeking my share of his pension due to his unreliability to support our children. Can I include in the decree that he elect me for SBP as well, or is it too late to alter his previous decision? Kate, I am preparing to retire from the Air National Guard in May 2019 and among other things I am trying to get some clarity on the RCSBP. If I retire (from the ANG) at age 49 and don’t begin drawing my (ANG) retired pay until age 60, exactly when do I begin paying premiums to the SBP whether I choose immediate coverage or deferred coverage? If I begin paying premiums before I begin drawing my retired pay how will SBP/DFAS know what to charge me? Another question: my wife is ~8 years older than I. I understand that if I die before I turn 60 that she will being receiving SBP; what happens to my premiums if she passes before I do? Am I still required to pay until I die or reach the “paid-up” status? I’m sure I have other things to ask but that should be a good start! Thanks for any info/help you may have. I realize that SBP is taxable for Federal taxes, what I can’t figure out is do I claim it on my taxes or do separate taxes for my son. Background: J (my now adopted son) is in fact my great nephew and still a minor (11yrs old). His father (KIA) was in the Army. His mother (my niece) died a couple years ago. I adopted their son. J is receiving SBP via his father’s service. Since I am claiming him as a dependent on taxes do I also include the 1099-R information on my tax return or should I also do a separate return under his social? If so – with the change in dependent status can I still claim him on my return? My husband retired from USAF and was receiving his retirement pay. He made a SBP election when we got married 19 years ago. He died 3 months ago. SBP charges were never deducted from his pay. I just got a letter from DOD stating these facts. They didn’t say what was going to happen, they just asked for a copy of our marriage license and his death certificate. They also send a claim form for SBP for me to fill out. Have you ever heard of this happening? What are they going to do to resolve the non-payment issue? Will I get SBP? Hi Katheryn. I’ve not heard of this situation. I hope you have a copy of the paperwork in which he elected SBP. I hope it works out for you. Please keep me updated! Im a former spouse was married with the retiree for 17 yrs.on our divorce decree stated that Im elected for SBP which I enrolled right away been paying it until retiree passed away last Jan.6,2019 I already sent my claim they received(DFAS) on Feb.1,2019 I had been calling them and they said they reuqusted to expedited it but also still under review. My question is the retiree was retired and 100% VA disabled I have 1 minor children with him am I entitled for DIC also? I received court ordered 1/2 of retirement military pay from my former spouse. I am 62 and remarried. I pay the SRB to ensure that upon former spouse death, I continue to get payments. SBP benefits are tied to the beneficiary. If you are the beneficiary, and you die, the payments will end. I am so confused. My husband was medically retired 5 years ago. At the time of retirement, we were sitting with the retirement officer and she explained our SBP as him only having to pay into it for 5 years instead of 10 years due to him being 100% at time of retirement. We were told at the 5 year mark to call and let them know to stop taking payments out because it had been 5 years. Now after doing so, I was told that this is a withdrawal time and that we basically would just lose everything we paid up to this point. We were never told that he had to pay 360 payments. We were advised that since he was medically retired that only 10 years had to be paid into SBP to receive the full benefit but that since he was deemed 100% disabled at the time of his medical retirement that he would only have to pay 5 years to receive the same benefit. I am so confused, please help. Thank you in advance. I’m not aware of any provision to continue having SBP coverage without payment until you have hit the 360 payment and age 70 requirements. The 5 year rule for 100% disabled veterans specifically permits them to fully discontinue coverage if they so desire. There is no refund of premiums if you make this choice. There are several reasons why you might want to continue having SBP coverage even if your husband is 100% disabled, including the Special Survivors Indemnity Allowance (SSIA), if the SBP benefit is larger than the DIC benefit, etc. I’m not sure if the retirement officer told you the wrong information, or explained it in a way that was confusing. I hope you have a better understanding of SBP now. Thank you for your reply. I did some further digging into the matter after I asked here. I found that the reason they offer the out after the 5 years is that you cannot get both and wouldn’t need the SBP since you’d get the DIC. The retirement officer never explained that. I asked many questions and wrote everything down to the T. I remember being so surprised that that’s how it worked because it sounded too good to be true which now I know it wasn’t. I don’t blame them though because even though it’s their job, I know they have a lot on their plate and tend to “where many hats”. Thank you for your reply, it is much appreciated. Yes, that’s the reasoning behind the offer. However, there are many reasons why you might still want SBP even if you’ll get DIC. You can get both, but the amount of SBP is reduced by the amount of DIC. I’ve written I think everything there is to know in this article: https://www.katehorrell.com/understanding-sbp-dic-offset/ In it, I’ve listed three good reasons why you would want to keep SBP even if you are guaranteed DIC: The SSIA entitlement, the possibility that the offset will be eliminated, and the fact that SBP is often more than DIC. I don’t completely understand what you’re trying to accomplish. You’re trying to get a refund of the SBP premiums that your father continued to pay after your mother’s death? Is that correct? Yes, that is partly correct. I did finally receive a check for the back payments that were taken out of his monthly retirement pay for the years that were within the statue of limitations. But they kept 6 years of back pay that were out of the statue of limitations – Barring Act 31. According to DFAS my Father was to notify the military that my Mother had passed away in 2006. I have no proof if he did this or not. Frankly, I think he may have been unaware. There was a lot going on at that time with my Mother’s death. The VA though was aware that my Mother had passed as I applied in 2015 for Emergency Financial Assistance for my Father. When the check for the payment in arrears arrived I was given the option to appeal the Barring Act 31 or I could request a waiver for the back pay that was denied. Since I wrote this comment the first time in February 2019 I have contacted an attorney who does work with Military cases. She had not had one of these cases before and decided to take it on. She faxed the Army to ask for an extension of time (this also was allowed). At this point we are still waiting to hear back from the Army on the extension. I guess my question ultimately is have you ever had a comment from anyone else that dealt with the Barring Act 31, and if they had success in receiving back pay that was out of the statue of limitations time period? I don’t know of anyone who has dealt with this situation. I wouldn’t even have thought it possible to request a refund. I’m a little surprised that the lawyer is willing to take on the case, but I often don’t understand the things lawyers choose to do. I hope you are satisfied with the resolution. Ms. Horrell, though I appreciate your consideration in my matter, I frankly would have thought it better if you had stopped yourself after the first sentence and left your personal comments out of the issue. Possibly this matter should be reviewed and more mention or notification made on the Military’s part in regards to a beneficiary’s death prior to the Veteran’s. But maybe I’m a little biased as my Father was a Colonel in the JAG Corps. Thank you for your time. I am married to a non US citizen and he is my beneficiary for the SBP. I am concerned about problems he might encounter after my death if taxes are to be collected since he is not a US citizen and does not have a SSN. I cannot find any information about this on any of the published SBP links. I cannot find anything stating that is not eligible to be a beneficiary. But if he is not, I need to stop paying these premuims now. I would be grateful if you can help. Have you asked DFAS this question? Thank you very much Kate. I had forgotten to consider the reciprocal tax treaty. I have not asked DFAS yet. I think they are extremely understaffed these days. It has taken me 6 months to get them to use the correct mailing address and I am still waiting for some of my pay from last year. Waiting time on phone is average of 30- 45 minutes. They seem to struggle with international issues. Might get further with IRS.